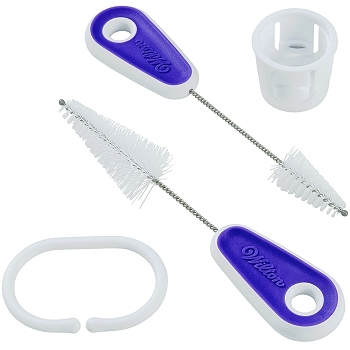 This essential tool collection includes a decorating bag cutter and cake decorating tip brushes. 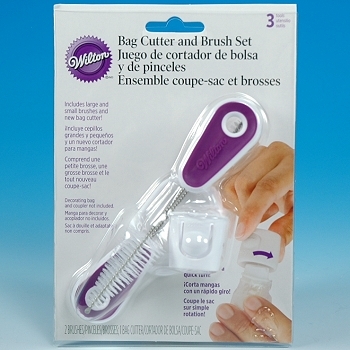 Decorating Bag Cutter easily and precisely cuts decorating bags and the two sizes of Tip Brushes make clean-up quick and easy. • Bag cutter cuts bags with a quick turn and is used together with Twist Quick Coupler. To use cutter: Insert inner coupler into bag. Slide on cutter with arrow pointing toward coupler. Squeeze side tabs, twist and cut!